Add your name to the letter urging President Obama and Attorney General Holder to deploy federal marshals to protect Missouri from an out of control and extremely violent police force. It's only getting worse in Ferguson, Missouri. We just saw another night of police tanks rolling on protesters, deploying tear gas and volleys of rubber bullets into crowds. Police continue to target and shut down journalists in an attempt to mask the ugly and violent situation continuing to unfold. It's time for Attorney General Eric Holder and the federal government to take over public safety and criminal prosecution in Ferguson, Missouri. Tell President Obama and U.S. Attorney General Eric Holder to step in and provide federal marshals to protect Missouri residents from an out of control police force. Many were injured in the war-like environment as police displayed a blatant disregard for civil rights — unlawfully arresting dozens of people including members of the press and even a St. Louis alderman. Missouri Governor Jay Nixon then put the Highway Patrol in charge of keeping the peace in Ferguson, which temporarily improved the situation. But after local police defied the Department of Justice and released an inflammatory video of the victim, the situation began to deteriorate once again. Missouri's Gov. Jay Nixon has called out the Missouri National Guard to help secure the suburb outside of St. Louis -- local media report that "roughly 80 National Guardsmen will be tasked with protecting the police command center in Ferguson. "4 However, last night with the National Guard on the scene the situation only got worse. What's more, apparently the National Guard was called in without consulting the Department of Justice or the White House. The extreme and militarized response by Missouri law enforcement, coupled with a lack of transparency with regards to some of the most basic details of the case, has contributed to local distrust and rage which is now erupting in isolated incidents of violence. Gov. Nixon's attempts to de-escalate the situation on the ground have been woefully inadequate -- and his latest move to call in the National Guard may prove to make matters worse, not better. President Obama and U.S. Attorney General Eric Holder must take immediate action to increase oversight and enforce a higher national standard that ends rampant police misconduct and protects the civil rights of African-American Missourians. If not, matters will only get worse. Join CREDO and ColorOfChange in calling on President Obama and Attorney General Holder to intervene and protect the people of Ferguson from an unaccountable and violent police force. Systemic militarization of law enforcement combined with long-held racial bias and the criminalization of African-American residents has turned those exercising their constitutional right to peacefully assemble and protest in Ferguson into enemy combatants in the eyes of a highly militarized and violent police force.8 This must end, and there's no time to waste. More than 100,000 CREDO and ColorOfChange activists have taken action demanding justice for Michael Brown. Will you join us in standing up for justice for Michael Brown and other victims of police violence? P.S. CREDO is working with We Act Radio to broadcast a progressive livestream on the ground at the Ferguson protests. You can watch the livestream here. If you can chip in $5, $25 or $50 to help us keep the livestream on the air, please make a contribution via ActBlue. 1. "The Most Outrageous Police Tactics In Ferguson", Think Progress, August 14, 2014. 2. "Eric Holder Authorizes Second Autopsy Of Michael Brown," Huffington Post, August 17, 2014. 3. "Autopsy Shows Michael Brown Was Struck at Least 6 Times," New York Times, August 17, 2014. 4. "Gov. Nixon directs National Guard resources to Ferguson," KMOV 4, St. Louis, August 18, 2014. 5. 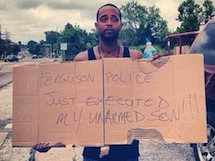 "Amnesty International Takes "Unprecedented" U.S. Action In Ferguson," BuzzFeed News, August 17, 2014. 6. "Transcript: Obama's remarks on unrest in Ferguson, Mo., and Iraq," Washington Post, August 14, 2014. 7. "Ferguson's Congressman Has 'No Confidence' In Local Cops To Give Brown Family 'A Fair Shake'," Huffington Post, August 17, 2014. 8. "Ferguson and the Militarization of Police," U.S. News and World Report, August 14, 2014.